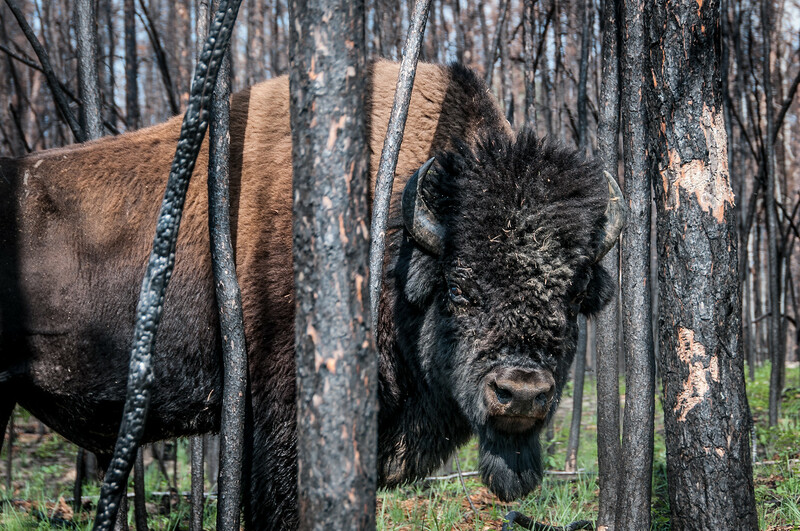 Situated on the Northern Boreal Plains in the north-central region of Canada, Wood Buffalo comprises a vast wilderness area (44,807 km2 ) which is home to North America’s largest population of wild bison. It is also the natural nesting place of the whooping crane. Another of the park’s attractions is the world’s largest inland delta, located at the mouth of the Peace and Athabasca rivers. The park has four main landscape features: a glacially eroded plateau; glaciated plains; a major freshwater delta formed by three major rivers; and alluvial river lowlands. The lowlands and floodplains of Peace, Athabasca, and Slave rivers and the delta in Lake Athabasca exhibit classic fluvial landforms, with a complex series of meander scars, oxbow lakes and former river terraces, and good examples of birds-foot delta development. 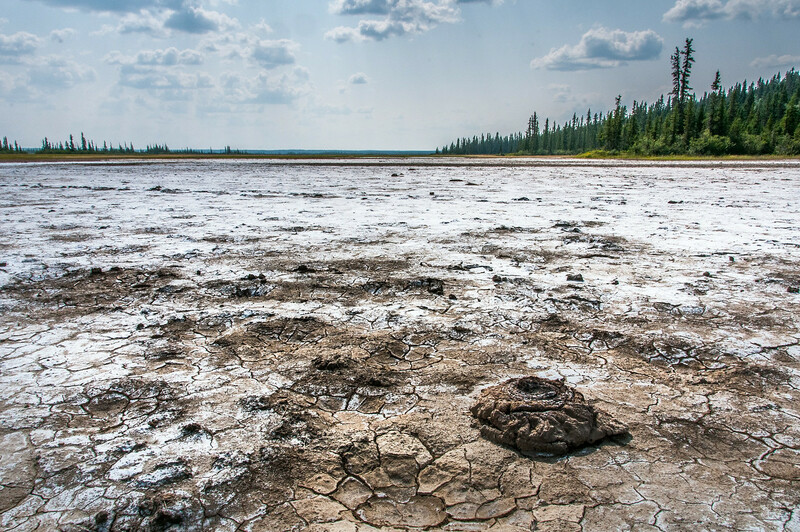 During dry periods, the mudflats of one plain are dominated by mineral salts. These salt plains are unique in Canada. Vegetation is typical of the boreal forest zone with white spruce, black spruce, jack pine, and tamarack predominant. Many watercourses have stands of balsam poplar and some upland has almost pure stands of aspen. Extensive stands of white spruce forests cover the banks of Peace, Athabasca and Birch rivers. The upper surface of the plateau is about 1,500 m above the rest of the park and supports a spruce-willow-birch upland tundra community. Some areas of prairie occur. Shrublands of willow and alder occur where wet marsh soils meet drier forest soils. There is also extensive muskeg in the west and north of the park, an association of black spruce, sphagnum moss and northern heath plants. The park contains the largest undisturbed grass and sedge meadows in North America. The park was created specifically to protect North American bison, one of the largest free-roaming, self-regulating herds in existence, and consisting of a cross between ‘wood’ bison and ‘plains’ bison. This is one of a few sites where the predator-prey relationship between wolves and bison still exists. A total of 46 other mammal species had been recorded including black bear, woodland caribou, Arctic fox, moose, gray wolf, lynx, snowshoe hare, muskrat, beaver, and mink. Occasionally animals more common to southern Canada are seen, such as red fox, porcupine, and white-tailed deer. The caves of karst lands provide essential hibernation sites for bats. Wood Buffalo is a park of superlatives. Lying approximately 2/3 in the province of Alberta and 1/3 in the Northwest Territories, the park is the largest national park in North America and the 2nd largest national park in the world. It is home to the largest population of bison, the largest animal in the Americas. It is also the nesting ground for the whooping crane, the largest bird in North America. It is also home to the world’s largest beaver dam. It is also the world’s largest dark sky preserve. Because of its location and lack of mountains, Wood Buffalo often is overlooked for parks such as Banff and Jasper which are more accessible and have more dramatic scenery. 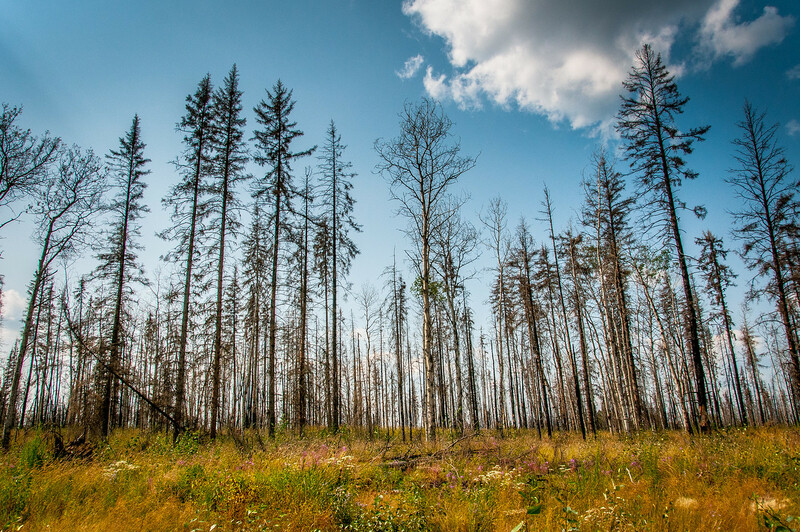 Yet Wood Buffalo might be one of the most important wilderness areas in North America. Its bison and wolf populations are probably the most healthy in the world. The endangered whooping crane, of which there are only 500 in the world, nests here. Animals aside, the geology of the park makes it highly interesting. There are many karst formations and sinkholes scattered throughout the park and it is also home to the only salt plain in Canada (which can be seen in the photo above). Wood Buffalo National Park is a natural UNESCO World Heritage Site in Canada. It was inscribed in 1983 and is currently governed by Parks Canada. Wood Buffalo National Park is located in Alberta and Northwest Territories provinces of Canada. The park itself was established in 1922 and covers about 45,000 square kilometers in land area. With this size, Wood Buffalo National Park is the largest national park in Canada. In fact, the park is larger than Switzerland! It also ranks number two in the world for the largest national park. 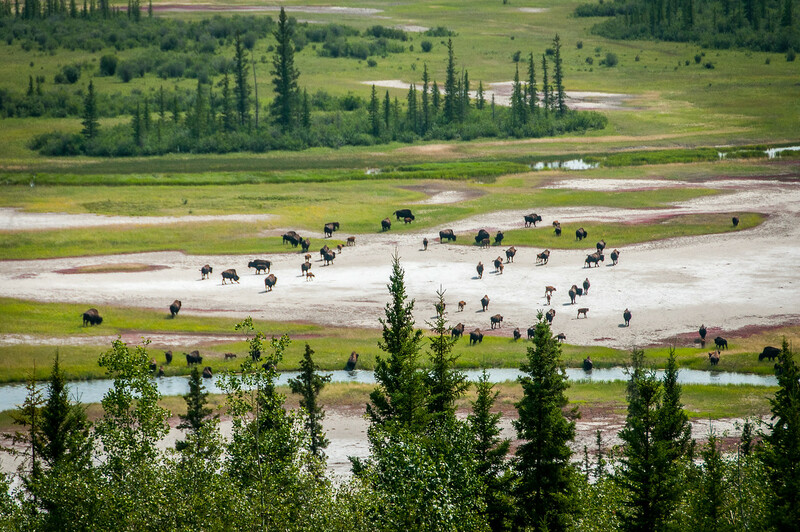 This park is recognized by UNESCO as the home of the largest herd of free-roaming wood bison. There are 5,000 of them at the park. In addition to the wood bison, Wood Buffalo National Park is also a nesting site for whooping cranes. Wood Buffalo National Park is recognized for its natural value due to the rich amount of biological diversity within the park. In particular, the Peace-Athabasca Delta is where many of the wild bison and other wildlife rely on for sustenance and survival. This delta is also among the largest freshwater deltas in the world. 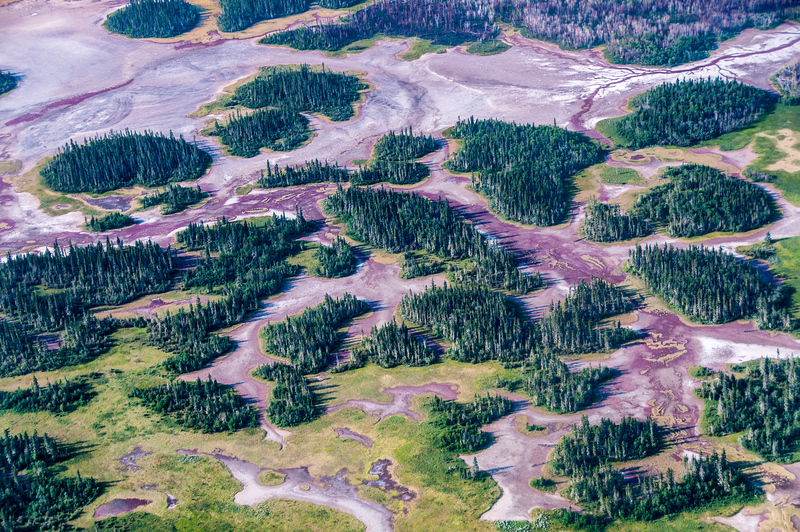 It offers 3 major environments within a single park: 1) fire-scarred forested uplands, 2) Peace-Athabasca Delta, and 3) plateau etched with meandering streams and bogs. In addition to these, the park also features extensive salt plains that can grow up to 2 meters high. In addition to it being named as a UNESCO site, Wood Buffalo National Park is also recognized by the Royal Astronomical Society of Canada was one of the dark-sky preserves in the world. This is designed to preserve nighttime ecology within the park premises, in order to facilitate the survival of various nocturnal species such as bats, owls, and nighthawks. Since the park is also a popular destination for tourists who seek the northern lights, this is also a good way to preserve and improve the tourist potential of this park. Aside from the large herd of wood bison in Wood Buffalo National Park, the park is also notable for its karst sinkholes. These are concentrated on the north-eastern part of the park. Aside from the sinkholes, the largest spring in Alberta is located within the park premises. It is the Neon Lake Springs.